Please note that Mr. Rhee: Surviving the Nightmare World is on Kickstarter now. 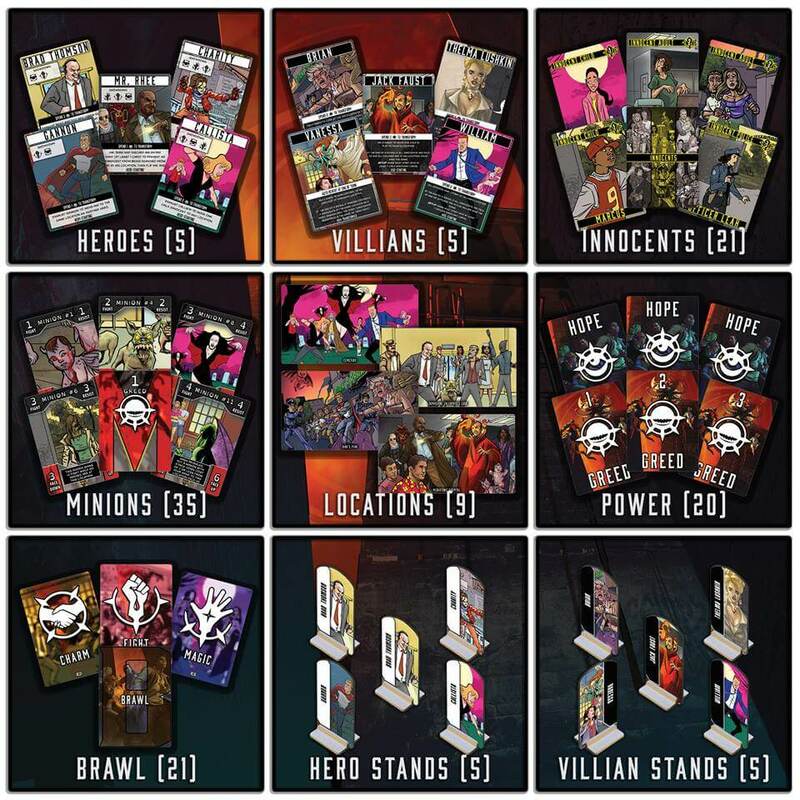 Here at Big Boss Battle, we don’t think it’s possible to have too many tabletop games based on rich, comic-book worlds filled with interesting and unusual characters. The Nightmare World series from Dirk Manning isn’t a series we know well, but in growing anticipation of the upcoming Kickstarter for Mr. Rhee: Surviving the Nightmare World, we’ve been reading all about it. In doing so, we think it’s almost unbelievable that this intellectual property hasn’t been converted into a game until now! 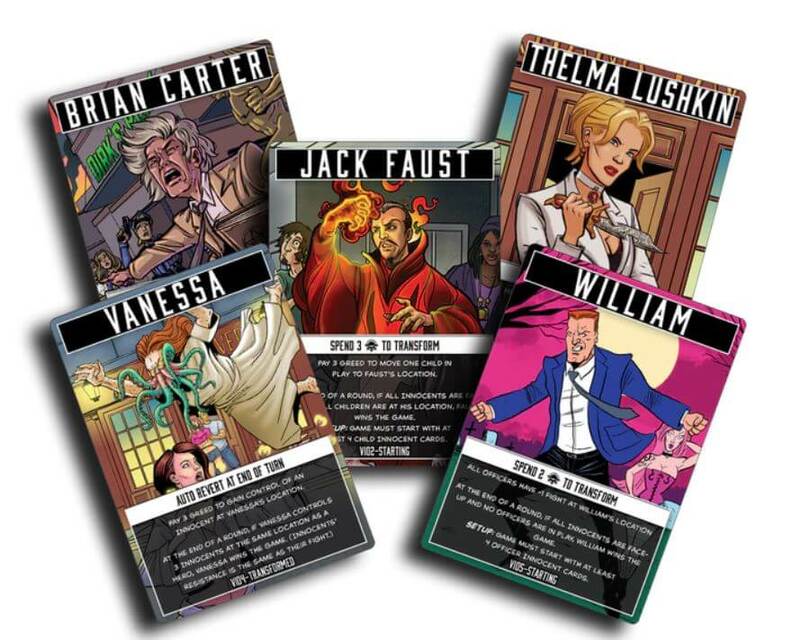 In a nutshell, Mr. Rhee is an asymmetrical card game for three to five players in which a single good player controls a team of heroes and each other player controls a single villain. The hero has a clear objective — run the doom clock down through six turns (representing the day and night over three days) whilst preventing each villain from either capturing two locations or obtaining their own personal objective. The good player has access to exactly as many heroes as there are villains but, being the good guys, heroes are happy to cooperate where villains are not. Yes, indeed, the villains in Mr. Rhee are each out to achieve their own objectives, so whilst they may sometimes choose to form temporary alliances to overrun a heroic defender, only one can take control of a given location or win the game. Turns in Mr. Rhee are split into two key phases — The Chase and The Showdown. During The Chase, the villain player spends greed by flipping face-up Greed cards onto their Hope side, which in turn becomes a resource for the hero to spend on bolstering their defences. The more greed a villain has, the more minions they can summon — either face down for a lower cost or face up, usually for a more powerful immediate benefit, albeit at additional cost. The hero player then use the face-up Greed cards (now showing their Hope side) to purchase Brawl cards. Brawl, Charm and Magic cards are all available, but different heroes have certain strengths and limitations — some heroes can’t use magic cards at all — so building the hero deck is a key part of the game. When The Showdown begins, the villains attack locations (each of which has its own features) and attempt to overrun the innocents currently occupying it. The heroes, on the other hand, work together to stop the villains by adding their brawling strength to the locations in question, charm the minions to fight against their masters or simply eviscerate them using magic. The hero player has just one deck of cards to share between all heroes, so there’s an element of strategy in deciding what cards to include and when to use them. We haven’t had our hands on a copy of Mr. Rhee yet, but we have explored a print-and play-copy, examined a draft version of the manual and worked our way through a lot of the supporting fiction. The most striking thing about the game at the moment is the artwork and the way that the rich, comicbook lore comes across in how the game looks and how it is set to play. The game appears to convey a real sense of drama and excitement, with some very real peril for the innocent inhabitants of Nightmare World. Mr. Rhee: Surviving the Nightmare World is on Kickstarter now, should you want to back it. You can also visit the website of publisher Greenbrier Games.